All packs are frame rate friendly. 5. XvM Lite: Stripped down to have as little as possible in game, stats after the match and in garage plus a few useful options on. Auto return equip and bought for credits for example. 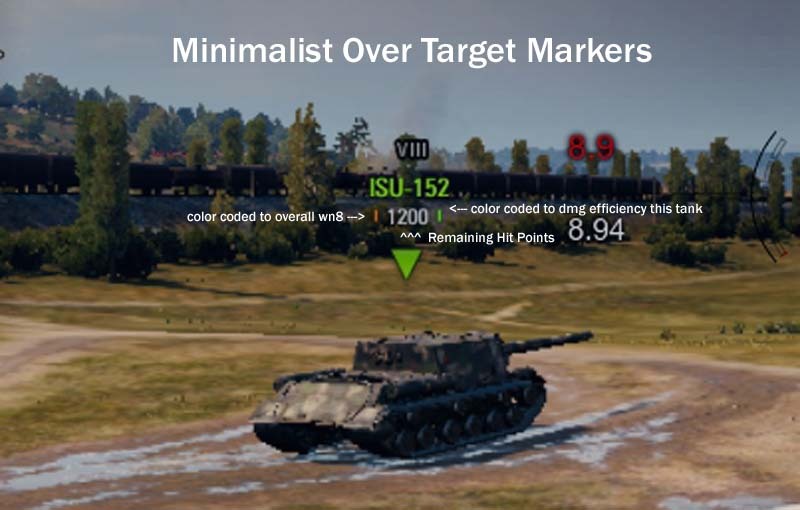 Over target marker shows tank tier, tank class, tank name and remaining HP on that tank. JdgDReDD's custom color coded additions to the over target markers (tick Marks beside HP remaining value) in the over target markers, allow you to gauge who you're up against and who you're playing along side. The left tick (beside the tanks remaining hp) is color coded to the players over all wn8, the right tick (beside the tanks remaining hp), is the players damage efficiency in that vehicle (xte). Both markers are color coded as follows ... Worst to Best: Red, Orange, Yellow, Green, Blue, Purple. Holding alt shows Player name, Health Bar and 4 digit WN8 rating. The enemy text has a better shadow color and larger font for greater visibility. The "res_mods" AND "mods" folders must be empty except for the numbered folder that matches the current version of World of Tanks. "1.4.0.1" for example (the folder with the highest numerical value is the newest version of the game and older folders can and should be deleted). 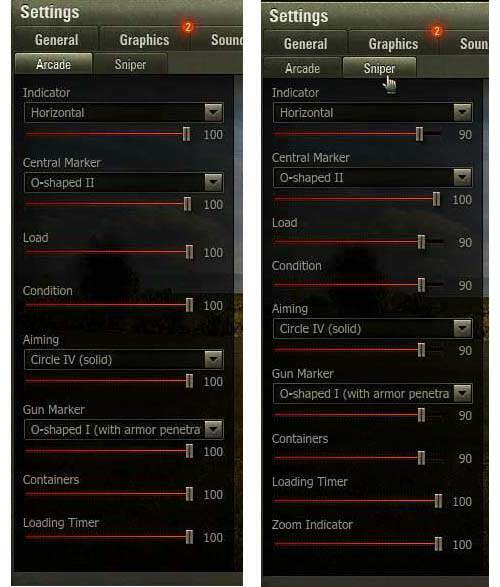 4) **WoT settings - Go In Game to the WoT settings - (First) Goto general tab, then scroll down to the bottom right and select "always" for enhanced features on the mini map. (Second) in the General Tab, Enable 25x zoom. (Third) in settings, Battle Notifications Tab / Log Tab, Enable Summary Stats except for damage caused (all packs except lite version). Lite users enable features as desired. See images below. 5) Sight Installation - (optional) Download & Extract the Sights Only Pack to the World_of_tanks folder. Example: install xvm full pack then jimbo sights so you can get sights and xvm only, no mods. Fresh install every Major patch (if you have the bandwidth!!) Save yourself a few headaches, about 25% of the time the Update is the nearly the same size as the full install. To do this browse to C:\Games, right click World_of_Tanks, right click and select delete, then download the full client again(or you can uninstall the normal way through control panel). Pls note, you can have multiple installs of world of tanks, just copy and paste the main wot folder. 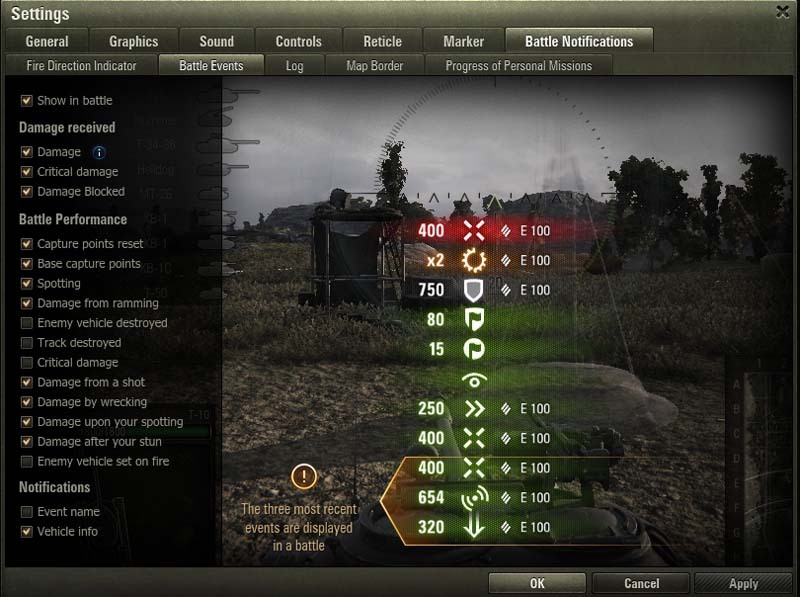 c) replays - dependent on WoT settings whether replays are being recorded and saved. 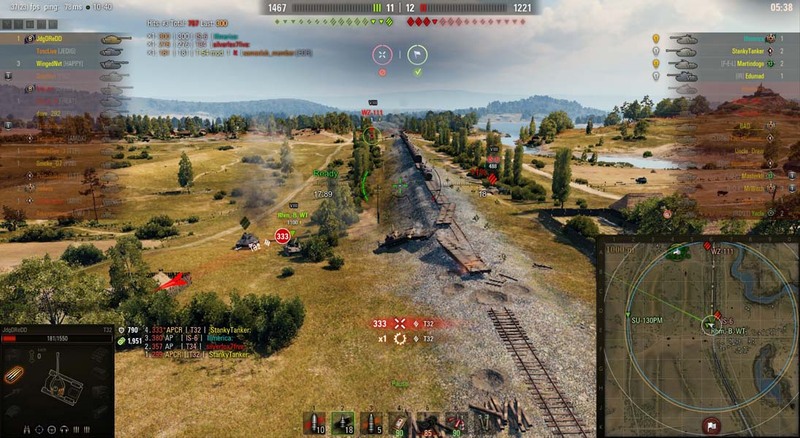 XvM can be restored to default settings in any pack by simply deleting the file "xvm.xc" file located in "C:\Games\World_of_Tanks\res_mods\configs\xvm" folder. FOR THE RECORD: my xvm full, Lite or vanilla packages can be installed OVER any other config you're running. Edited by JdgDReDD, 01 April 2019 - 04:27 AM. Version 3 is out On "ALL IN ONE PACKS" !!! Edited by JdgDReDD, 13 March 2017 - 06:57 AM. Just uploaded a pack with all the mods but no XvM. You can find it here named "All Mods No XvM"
so version 4 is out, in the "all in one packs"
Updated YasenKrasen in the "all in one packs"
Edited by JdgDReDD, 19 April 2017 - 11:34 AM. Version 3 is out !!! Edited by JdgDReDD, 23 April 2017 - 09:05 AM. 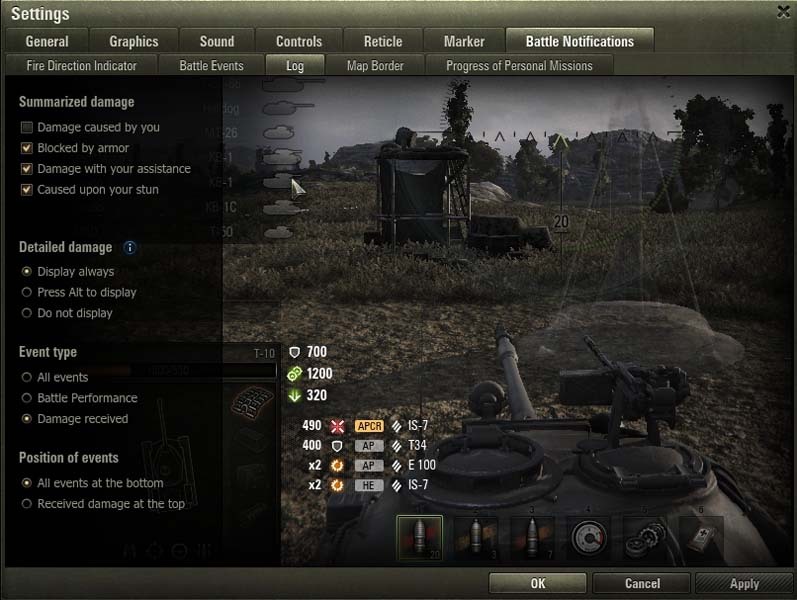 Enabled the stock (WOT) damage logs. Added a patch to remove clock in hangar, Find the patch here, replace when asked. (clock removed will be std in version 5 when its out). Edited by JdgDReDD, 24 April 2017 - 04:25 AM. I found one. It requires a subscription!!! Edited by JdgDReDD, 03 June 2017 - 06:15 AM. Edited by JdgDReDD, 05 June 2017 - 09:12 PM. Version 2 for 0.9.19.0.2 is OUT!! WOT Asia / Australasia Language Based Communities → English Speaking Community → Forum Archives → Locked Thread Archive → Poll Swedish Strv campers, Lossing front line battle.